Over the years Tucson has grown to become a very popular destination for winter visitors, second home owners and retirees, in addition to substantial growth in business and industry and the jobs that go with it. This popularity has contributed to thousands of Tucson homes being built in new residential subdivisions springing up all around Tucson – in the Northwest (OroValley), West, South and Southeastern Tucson – but not in the Catalina Foothills. And that’s an important distinction. Because of a very limited supply of vacant buildable land, and certainly no large tracts of land, plus zoning regulations that typically designate residential lots as one home per acre, the Catalina Foothills have not experienced that kind of development. The Foothills is a relatively small,(about 36 sq. miles) established area, that is pretty much built out, so what you see is what will be, with, of course, some exceptions. 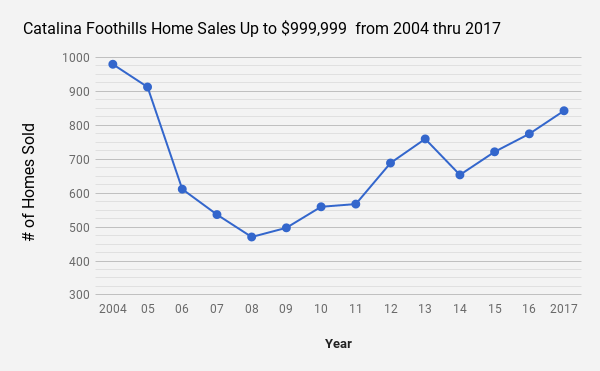 For perspective, in 2017 Foothills home sales accounted for just 7% of the total number of homes Sold in the greater Tucson Metro area – 12,438 homes sold in the greater Tucson Metro — 898 sold in the Catalina Foothills. 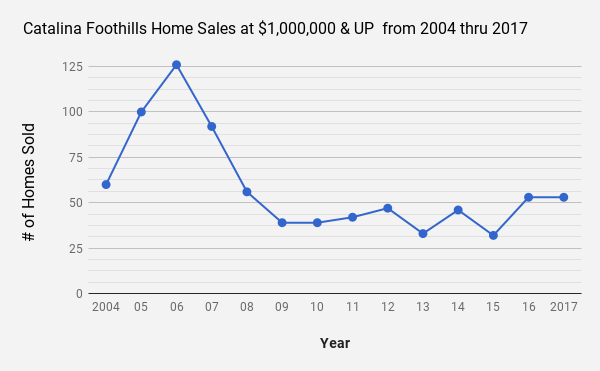 Yet the Foothills accounted for 14% of the total dollar volume of all the homes sold. Yes, homes in the Catalina Foothills are costlier than other areas of Tucson. And like many other cities and towns across the US the Foothills did not escape the extreme highs and lows of the real estate boom and subsequent bust. 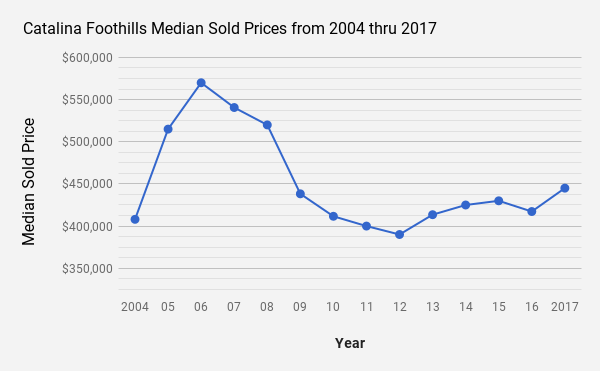 As you see in the chart, the big drop-off in foothills sales occurred in 2006, though the drop was in homes priced under $1,000,000. Meanwhile the $1,000,000+ market rose 30% in 2006. But that was its last hurrah. After 2006 sales at $1mil+ dropped year after year, and to this day the $1mil+ market continues to struggle. Oddly enough, as home sales fell, home prices continued to rise, peaking in 2006 -2007 before finally succumbing to the drag of a slower market in late 2007. Prices then continued to fall, and steeply, until bottoming out in 2012. Since then prices have risen, but slowly. Now, thru 2017, median sold prices are up just 14% since bottoming out in 2012, and still a long way from their boom-time highs. In 2000 Pima Canyon opened for business in the Tucson Foothills, adding about 300 luxury home sites to the Foothills in one fell swoop. Developed on the very last large parcel of land, with wonderful mountain, canyon and city views, Pima Canyon is now mostly built out, with homes for sale starting at about $800k and going up to $4.0mil or more. 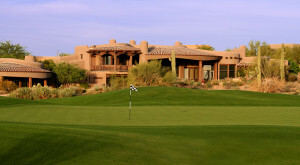 At the other end of the spectrum is Skyline Country Club Estates, built in the 60’s and 70’s, it was the first luxury golf community in the Foothills. 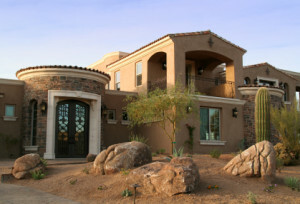 By late 2003, as the country began to recover from 9/11, Tucson started to catch the attention of more luxury home buyers, yet buildable land in the Foothills was becoming very scarce. Enter Skyline Country Club. It began to go thru a re-birth, a renaissance. Skyline has some of the best home sites in the Foothills, high up, and with magnificent views,and all of it in a very private, gated-golf course community. Homes that are old and out-dated, and quite a few of them are in Skyline CC, are either being knocked down and re-built or extensively renovated. And because the land is so valuable, economics dictates building larger more expensive homes on those lots. See my post – teardowns in the Tucson Foothills for more on this. Two other unmistakable signs of the scarcity of buildable land in the Catalina Foothills was the boom time trends of building luxury homes on what I’ll politely call in-fill lots – less desirable lots scattered here and there throughout the Foothills – and the breaking up of the original multi-acre Catalina Foothills estates homes – homes that were built in the 1930’s and 40’s – and subdividing the land to build new luxury homes on one acre lots. See my post- going through changes with a Joesler in the Tucson Foothills for more on this trend. However, this rush to luxury home building in the Catalina Foothills got to the point where the supply of luxury homes far outstripped the demand. And as the market continued to weaken the disparity between supply & demand led to the growth of high-end distress sales. And while the era of distress sales is now well behind us the luxury market continues to struggle. But despite the fluctuations of the market, the Catalina Foothills continues to attract those who appreciate its natural beauty, gorgeous climate (for much of the year) and its easy southwestern lifestyle.